We love multi-tools. We love really compact multi-tools that we can easily bring along with us. After all, the best multi-tool is the multi-tool you have with you. We have seen quite a few multi-tool that attach to a keychain. However, the Swiss Tech Utili-Key Multi-Tool is the first multi-tool that we have seen that is shaped like and the size of a key. 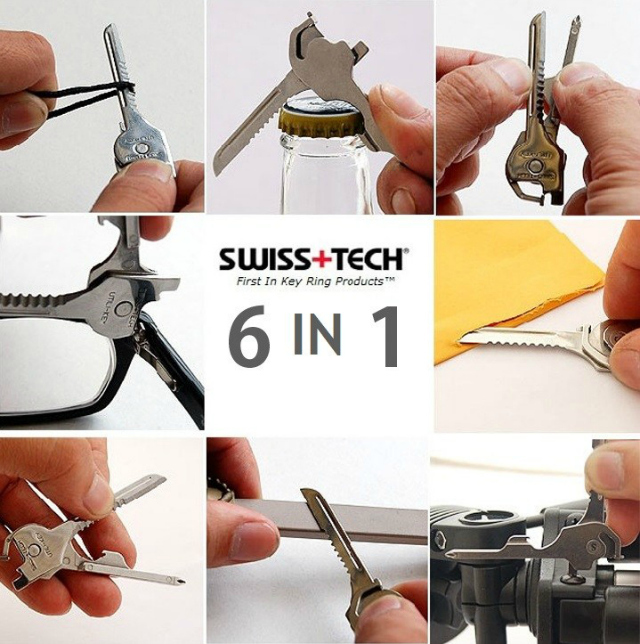 The Swiss Tech Utili-Key Multi-Tool is so small and takes up so little space, you can forget about it after you attach it to your key ring. That means that you will most likely have it with you when you actually need it. Best of all, the Utili-Key comes with a patented, quick-release, integrated locking system that makes it real easy to attach and remove from the key ring but keeps it well secured when locked in placed. You don’t have to struggle to detach it from the key ring like a normal key. The Swiss Tech Utili-Key Multi-Tool is main from high-quality stainless steel and has a stylish polished finishing.